Although the precise origins of UMass Peacemakers are murky, by 1982, the group was an active presence on the UMass Amherst campus organizing opposition to militarism and the nuclear arms race and providing support for the nuclear freeze movement. Organizing vigils, demonstrations, informational workshops, and providing civil disobedience training, the Peacemakers were the most visible pacifist group on the UMass Amherst campus in the 1980s. 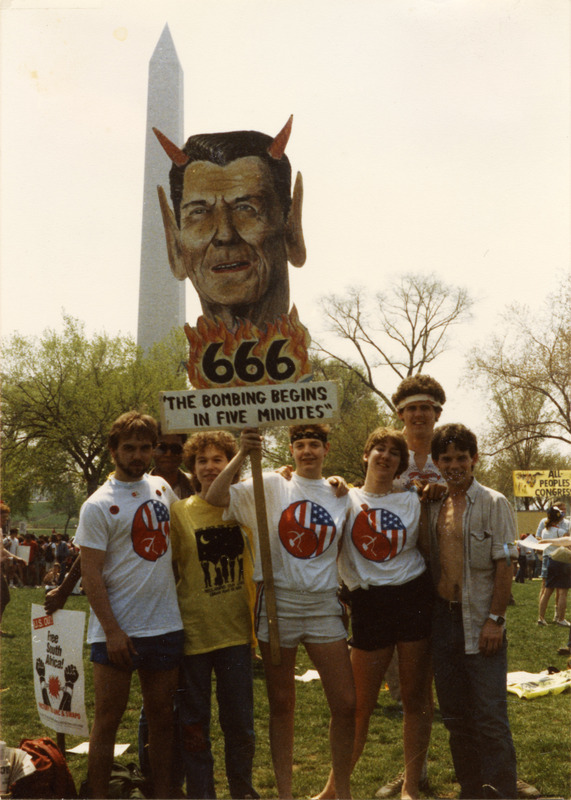 The UMass Peacemakers Records focus on the activities of the student group between 1983 and 1990, documenting their role in confronting the aggressive international expansionism of the Reagan administration and its “Star Wars” program, while also engaging at the local and national level by organizing rallies, lectures, poetry readings, and film screenings. At UMass, Peacemakers was part of the larger Progressive Student Network, and worked alongside other student organizations including the Radical Student Union. Established in western Massachusetts in 1863 as the Massachusetts Agricultural College, the University of Massachusetts Amherst is a national research university and the flagship campus of the state’s five-campus University system. UMass, one of the founding members of the Five College Consortium established in 1965, offers reciprocal student access among the University and Amherst, Hampshire, Mount Holyoke, and Smith Colleges. The University currently enrolls approximately 24,000 undergraduate and graduate students, and offers 87 bachelors degree programs, 6 associates, 73 masters, and 51 doctoral programs in 10 schools and colleges. The Archives of the University of Massachusetts Amherst document the institutional memory of the campus and serve as the largest and most comprehensive source of information on the history and cultural heritage of the University. As the collective memory of the university, the repository contains official records and items having historical value such as records of governance, policy, operation of administrative offices, departments, research, programs, and publications. Unpublished materials in the Archives include photographs, films, memorabilia, administrative records of major university offices, and the papers of presidents, trustees, administrative officers, and members of the faculty. Please note that collections for individual faculty members, administrators, and students, as well as selected groups and administrative units at the University are listed separately in UMarmot. The Concordance to the Archives is an alphabetical listing of University departments, centers, groups, and other units, providing call numbers, when appropriate. Researchers may also wish to consult the online guide to UMass Amherst collections. Digital UMass includes a growing number of oral histories and digitized collections of papers and organizational records. YouMass is a wiki devoted to the history of the University and its predecessors, the Massachusetts Agricultural College and Massachusetts State College. Beginning in the 1970s, UMass Amherst began conducting oral histories to record the memories and experiences its community, and it has conducted several focused projects since, including projects tied to the 125th and 150th anniversaries of the university. The Department of Special Collections in the University Libraries regularly conducts audio and video interviews throughout the university and with members of the local community. 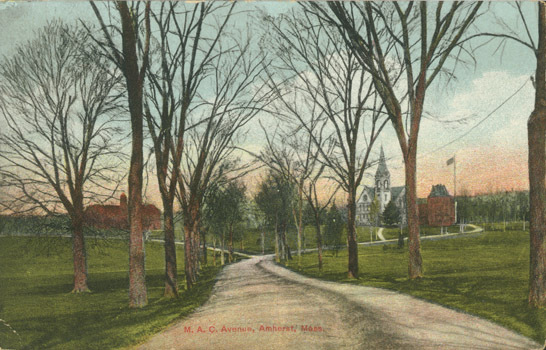 The new Massachusetts Agricultural College welcomed its first contingent of 34 students to campus on October 1, 1867, resulting in the first graduating class of 28 — the Pioneer Class of 1871. 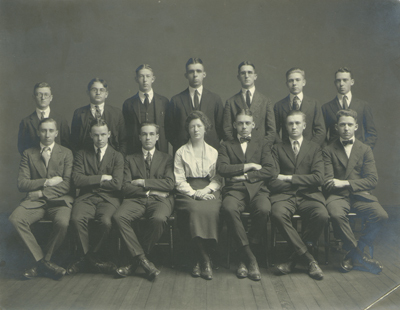 The student body waxed and waned in ensuing years as the college slowly began to diversify its curriculum and the students population itself, admitting international students as early as 1870, followed by graduate students (first degree awarded 1896), African Americans (class of 1901), and women (class of 1905). Enrollment at the university first topped 1,000 in 1945 rising to 6,000 by 1960. Following a tumultuous period of great expansion, UMass had over 23,000 students in 1970. Organized by class year, this series includes a diverse body of material generated by undergraduate students at Massachusetts Agricultural College, Mass. State College, and UMass Amherst from its beginning to the present day. Although the content varies widely from class to class and by period of time, typical years includes basic data on the graduating class, publications by alums, reunion information, class notes, photographs, or small collections of letters written while in school. In a few cases, the quantity representing an individual almuna or alumnus has led SCUA to treat the materials as a separate collection with its own finding aid. Moved to action after a successful and illuminating 2016 reunion of Black alumni of the University of Massachusetts Amherst, alumna Dr. Cheryl L. Evans (1968) decided to take on the critical project identified by the group, collecting and documenting the stories of the Black alumni who attended the University between 1960 and 1970. Dubbing these students “Black Pioneers,” given the dearth, and then growth, of Black students on campus during the decade, Evans used her connections with alumni and her history as a Black student leader to reach out about recording experiences for preservation and research purposes. In collaboration with Special Collections and University Archives, Evans began the “UMass Black Pioneers Project,” and sent an online questionnaire to around 85 alumni in September 2018. The survey addresses alumni’s backgrounds, academic and social experiences on campus, occasions of racial discrimination and activism, and current perceptions of the University and advice for students. Participation was voluntary, and is ongoing. The UMass Black Pioneers Project Records contain some planning materials and correspondence for the project, and primarily consist of written answers made in response to the “UMass Black Pioneers Survey.” In addition to the questionnaire, participants were able to send in physical materials, or upload digital content, such as resumes, or videos of their responses, and the collection contains a few of these. Several participants willing to be interviewed were also connected with UMass Public History graduate students for oral histories in the Fall 2018 semester. These videos are a part of the record group, and there are plans to conduct additional interviews. The Murray D. Lincoln Campus Center and Student Union is one of the hubs of undergraduate life at UMass Amherst, offering a range of facilities and services to the university community. In addition to the Campus Center Hotel and rooms for meetings, conferences, conventions, and special events, the Campus Center houses UMass Catering Services, retail food outlets, student cooperative businesses, administrative offices, and the University Store. The Student Union houses student organizations and other stores and food outlets. The archives of UMass Amherst contain tens of thousands of formal and informal photographic images of the campus community from its founding in the 1860s to the present. The collections have been organized into over twenty discrete series. Digitized version of approximately 13,000 of images are available online. This record group consists of materials gathered from university offices, units, and centers responsible for admissions, financial aid, and student services (including housing, health and religious services, disability services, academic support, transportation, and campus safety). Included in this record group are the records of Dean of Students, Vice Chancellor for Student Affairs, United Christian Foundation, Counseling Center Research Reports, Student Affairs Research and Evaluation Office and Student Affairs Research, Information and Systems (SARIS) reports, and Pulse Surveys. Since the arrival of the first class of students at Massachusetts Agricultural College in 1867, the student body at UMass has grown to over 20,500 undergraduates and nearly 6,000 graduate students. Record Group 45 includes the collected records of student activities at UMass Amherst, from student publications and organizations (fraternities and sororities, unions, and honorary societies) to records of student government, student protests, and religious and social groups. Also included are class notes and correspondence of some individual students while enrolled in the University. A number of student publications have been digitized and are indexed in YouMass. Since almost the time of first arrival of students at Massachusetts Agricultural College in 1867, the college’s students have taken an active role in publishing items for their own consumption. Beginning with the appearance of the first yearbook, put together by the pioneer class during their junior year in 1870 and followed by publication of the first, short-lived newspaper, The College Monthly in 1887, students have been responsible for dozens of publications from literature to humor to a range of politically- and socially-oriented periodicals. This series consists of the collected student publications from Massachusetts Agricultural College, Massachusetts State College, and UMass Amherst, including student newspapers, magazines, newsletters, inserts, yearbooks, and songbooks. Publications range from official publications emanating from the student body to unofficial works by student interest groups or academic departments. Links to digitized versions of the periodicals are supplied when available.